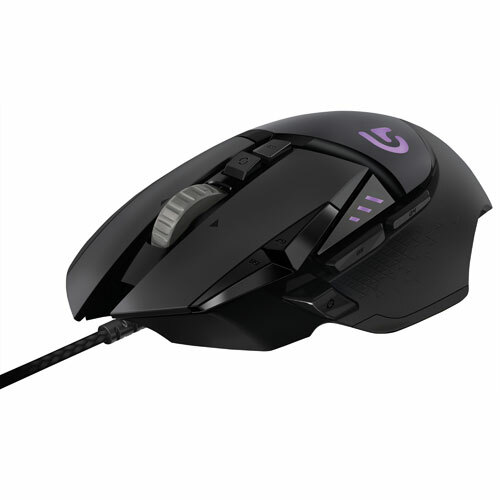 Make the Logitech G502 Proteus Spectrum gaming mouse your weapon of choice for PC gaming. It features G Delta Zero optical sensor tech that delivers up to 12000 DPI for exceptionally accurate tracking. Five included tuning weights lets you control the weight and balance, and 11 programmable buttons put your macros and commands at your fingertips. Dropped it from desk height not that often but then the middle mouse broke. I bought another one, and dropped it twice from desk height on accident and the middle mouse broke again. I decided to bear with it, and then the sensor became not reliable anymore, the DPI seems to be changing for no reason even when I checked if the program changed. Pretty disappointed with its durability and reliability. This mouse is very comfortable to use. I have 18cm hands and found the g403's hump to be a tad high for my liking and the g203 was too small. Materials feel high quality and software to customize RGB, buttons, and sensitivity was easy to use. Would buy again. Lemme start by saying that mostly, this is a well designed mouse. It's just got two flaws that I've found. Unfortunately, either one of those is a dealbreaker for me. First, it causes high pitches noises in my speakers when it moves. Some sort of high frequency interference. That's probably not going to be a thing for most people, so that's not a reason to avoid this product. The second problem, however, is a big deal. That is the scroll wheel. It spins too freely, with no resistance, and an inconsistant sensor. Scrolling is struggle, it often reverses direction for little jumps. The mouse wheel is sensitive. And when I say sensitive, I mean that picking up the mouse without touching the wheel will scroll 3-4 pages. I tried this thing for 15 minutes, and I'm now using my touchpad until I can take it back and get something that works. This mouse is a top-quality, low price mouse made by LOGITECH. Has a very comfortable feel for the hand and provides an amazing gaming experience with all it's programmable buttons. Wouldn't recommend it enough for all gamers out there! Its amazing! The size is good, and the feel, the side buttons, the scroll wheel changer, and the dpi changer. I've never had a better mouse! I couldn't have found a better mouse with this good quality ever, in fact I found that it has the exact right a mount of buttons on each side. I highly recommend you get it but the shipping is exotique out of this world it arrives exactly on time or it did for me at least. You should really get the G502 its the best one out there no joke. I bought this mouse last week and it's been pretty great. It has a maximum DPI of 12000 and different profiles for different LED lights and DPI as well. There is also a Logitech Software you can download. What this does is that it programs your mouse to light up with different colors and have different DPI. You can also assign the buttons on your mouse to do different things. (You can make your right-click have the left-click function.) But overall, this mouse has been very great. This is a quality mouse, it could have used 4 buttons on the side, but regardless this mouse is quality. 5 Stars. I like this mouse, but the buttons sometimes get in the way of my left click if I'm clicking very fast. Other than that I highly recommend buying this gaming mouse. Absolutely fantastic wired mouse. Feels good to hold and move around once you put some of the weights on it. The laser is very precise when optimized through the Logitech Gaming Software. Excellent customization options with lights and DPI. I got this mouse after my disappointing experience with Mad Catz mouse and the G502 does not disappoint. Since my hands are a bit bigger I currently hold it like a claw. One feature that I really like is that you can not only change the DPI by using the button on the mouse but also change it in the Logitech Software. Also, you can unlock/lock the mouse so that you can scroll without the click like a wheel. I use this mouse for both gaming and casual use and it has performed extremely well for both. I had this mouse for around 2 years now and it shows no sign of wear other than dust trapped in certain areas. Apparently you either love this mouse or hate it. I fell into the latter category. I really wanted to like this mouse based on the reviews here and on YouTube. I am using a Logitech Performance MX mouse. After many years it is wearing out. The G502 felt lighter and needed to put the weights in to get the heft I am used to. The weights did not fit as well as I expected. It was hard to close the door with them in. I had to fiddle with them. The RGB LED lights on the DPI indicator do not light up in a permanent manner. Only when the DPI is being adjusted. The G502 is smaller than the MX. It appears to be about 1/4" (6 mm) narrower. This small difference mad the G502 not as comfortable to hold. The most telling factor in my decision to return this mouse was the location of the Back button. If you are not careful and have large hands if you pick up the mouse to move it. While maintaining cursor location. You will press the Back Button with your thumb. This can cause the game to end.If you are playing a browser game. So for the above reasons I had to return the G502. I have had this mouse almost a couple days, took me all of those days to get used to it as I have been using a trackpad all my life. Now that I'm used to it, it's absolutely flawless for me. The ergonomics feel so good, for me, as I am not too sure how they would work for someone with large hands. Super easy dpi adjustments and 12k is way more than enough! If you want a good mouse for a good price don't think twice! Worked amazing, I really liked the grip on this mouse especially all the buttons it comes with. I've been using the Logitech g502 for over a year now and I have never experienced a single issue with it. This mouse is very good for gaming and I strongly recommend this mouse. I bought this mouse to replace my gaming mouse which died on me. This mouse is marvelous, it has several buttons which you can program and switch between 3 profiles. It has a switch to make the scroll wheel more tactile or loose. It has interchangeable weights to add or remove weight from the mouse. the braided cable is nice and sleek and the whole look looks amazing unlike some gaming mice which look kinda rediculous. it fits rather well in the hand, but something on the right side for your pinky might be nice, especially if you have larger hands. Overall this mouse is pretty great. Really enjoying the and addictional buttons. the scroll wheel is either way to lose and spins like a figet spinner or you push the botton just behind it and it hard and clinky. other then that great mouse. Wish the base where your palm sits was a little longer and wider for more support while gaming. Bought this mouse for use with my laptop at home, works teriffically, and I'm enjoying all the additional buttons. The scrolling action is a bit weird, but other than this it's perfect for me. Friends said i should try this mouse so I went from the Razer Deathadder to this and for the most part, I'm satisfied. I really like the weights, they improve my aim in some games. I dont like all the buttons.. it's really easy to hit wrong buttons if you have large hands. The DPI switch button is annoying, I constantly hit it when sniping in csgo and it totally throws my aim off. It also came with the wire all tangled and the fabric was ripped right by the mouse buttons, so sometimes the wire will prevent the mouse from staying flat on the pad.. probably just the one I bought though. The mouse itself is great but still returning it and going back to the deathadder. This mouse is the best mouse you can get in my opinion. I don't normally review products that I buy but this is too good not to. Before I got this mouse I was gaming with the simple logitech compact mouse and I thught it was amazing until I got this mouse. I have never been able to use the sniper rifles in csgo before I got this mouse. The mouse feels comfortable in my hand and works great with a finger or palm hold. (I can't say about the other holds cause I don't use them) the reaction time is amazing and you can customize the weight of the mouse. ( I like a heavier mouse so I use all the weights) the only problem is getting the weights in it takes some time and patience but the feel of a mouse that you can control the weight is well worth the time Stop reading this and get the mouse!!!!!!!! I grabbed this gaming mouse for Overwatch, Upgraded from Razer Orochi. I would said it is great mouse overall. Great build quality, impressive ergonomic and sensitivity. At last, the Logitech Gaming Software is straightforward, and functional. Great job Logitech. I'm happy with this purchase. Best I've owned. Drastically improved my K/D in Battlefront.